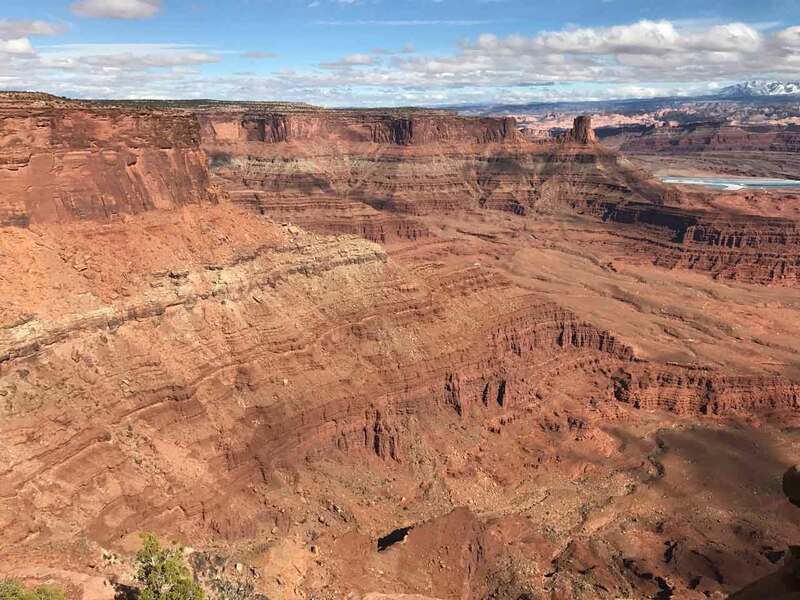 Rivaling any view that you will see at the Grand Canyon, Dead Horse Point State Park may have the most awesome view in all of Utah. 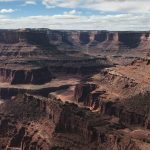 If you are looking for a day trip from any where in Utah, you should consider a visit to Dead Horse Point State Park. Dead Horse Point State Park is easy to find. Take Highway 191 South from I-70 for 21 miles (about 35 miles north of Moab). Take Utah State Highway 313 to the west and take it to the end following the signs. There is a fork in the road where you can choose between Canyonlands National Park or Dead Horse Point State Park. Turn left at this point and you are there. Pay the $15 fee and you are in. At times, the gatehouse is closed and one is expected to pay the fee at the visitor’s center. 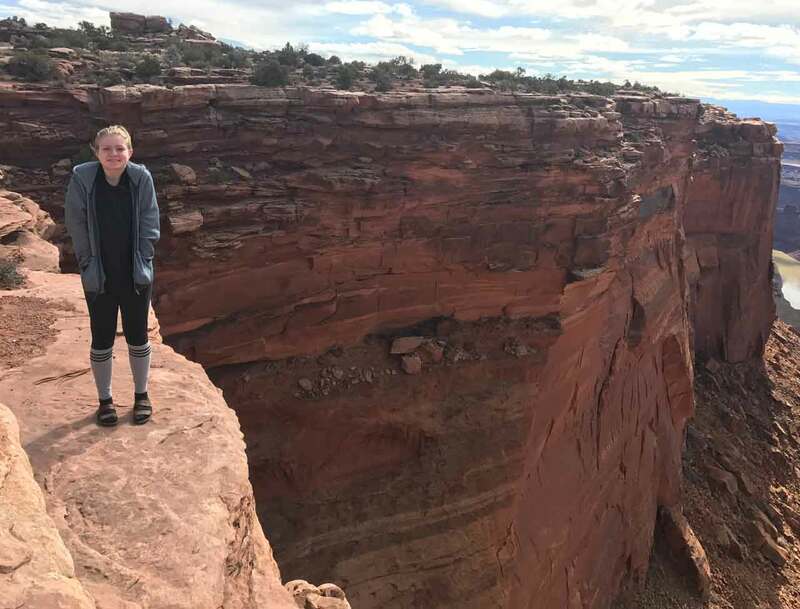 The Best Thing to do at Dead Horse Point State Park? Stop and Stare at the View. 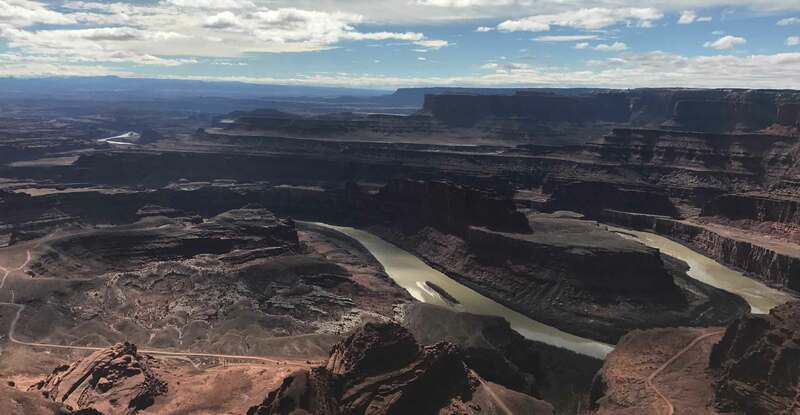 Having visited both Canyonlands National Park and Dead Horse Point State Park recently, I can tell you right away that Dead Horse Point State Park has the best amongst the two –The view south from Dead Horse point is absolutely incredible! Dead Horse Point State Park is much smaller, has some very nice simple mountain biking and hiking trails that offer great views. Canyonlands National Park, on the other hand, is much larger, has both a north and a south entrance and view areas, views of both the Green River and Colorado Rivers 2000 vertical feet below, an absolutely awesome White Rim Trail to explore and loads of other views and trails to enjoy. 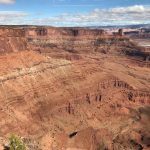 While you get more for your first hour of time from Dead Horse Point State Park, Canyonlands National Park can turn into a fabulous week long adventure. 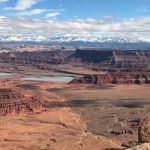 Dead Horse Point State Park offers 8 mountain biking trails (17 miles worth) from easy (green) to challenging (black diamonds) –click on the map to the right to get a better view. The trail system at Dead Horse Point is named the Intrepid Trail System which was first opened in 2009. These rides are perfect for beginning riders, families. If you are starting out in Mountain Biking, these trails are for you! 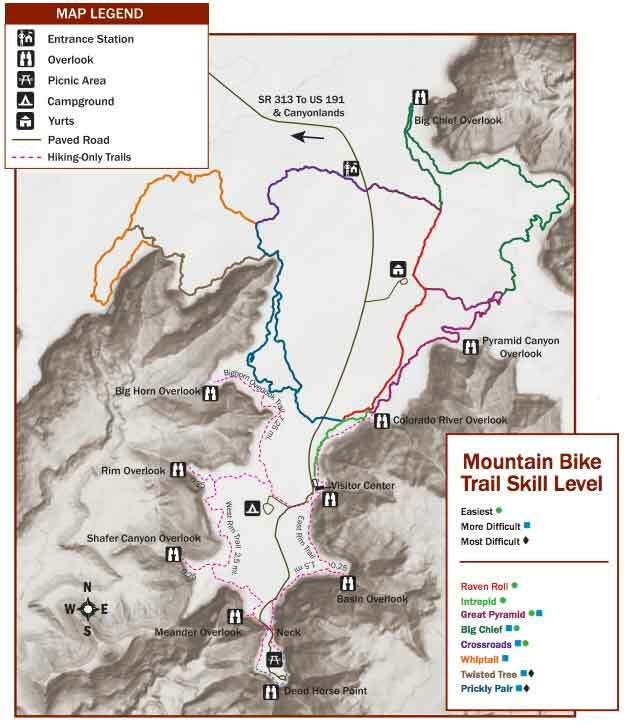 New trails became available in 2014 including the more challenging Prickly Pair and Twisted Pair Trails. Hiking is also allowed on these trails, but watch out for the faster visitors on bikes! Entry into the Intrepid trail system is best done by parking at the visitor’s center and finding the Intrepid Trail trail head leading north from the parking lot. Hiking at Dead Horse Point State Park is done best on the southern end of the state park. Begin at the visitor’s center parking lot with the East Rim Trail and follow the trail around the tip and back to the north on the western side. The best views are found the further south that you go in the park. 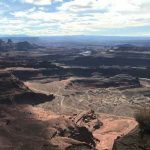 I am particularly partial to the views from the Shafer Canyon Overlook, Meander Overlook and the very tip at Dead Horse Point. While viewing the vistas is great from the naked eye. Using a pair of binoculars here will take you deeper into scenery and will cause you to spend a lot longer enjoying the view. View to the west from Dead Horse Point State Park. 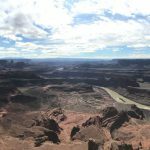 Views of the Colorado River, the White Rim Trail, and the Schafer Trail. View to the north-west-west from Dead Horse Point State Park. Views of the Colorado River, the Manti LaSal Mountains, and the potash evaporation ponds. View to the south from Dead Horse Point State Park. 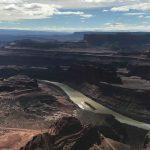 Views of the Colorado River, the White Rim Trail. Dead Horse Point State Park has 21 campsites at the Kayenta Campground. You will find a table, pad for your tent and even electricity at these reservable campsites. Be sure to bring your own water as the park has to truck in all of the water available in the park. Dead Horse Point State Park also has 3 yurts that you can reserve, rent, and enjoy. Dead Horse Point Falling Risk! Hold on to Your Pets and Kids! Our last visit to Dead Horse Point State Park was in February of 2017. It was one of the warmer February days with sun and temperatures in the low 50’s. But there was a cold breeze and a nice jacket was appreciated. Summertime visits can be very warm. Bring loads of water, sun glasses, sunblock, a hat, and sun protection for the arms and legs! I found these web sites as I prepared for my last visit. Maybe they will help you. Jeff enjoys having outdoor adventures with his kids, scouts, etc... Hiking, Canoeing, and mountain biking should be done in large quantites. As a Scoutmaster, he believes that In order to be a value to the boys, a scout troop should be taking the boys to do things that they wouldn't otherwise be able to do.